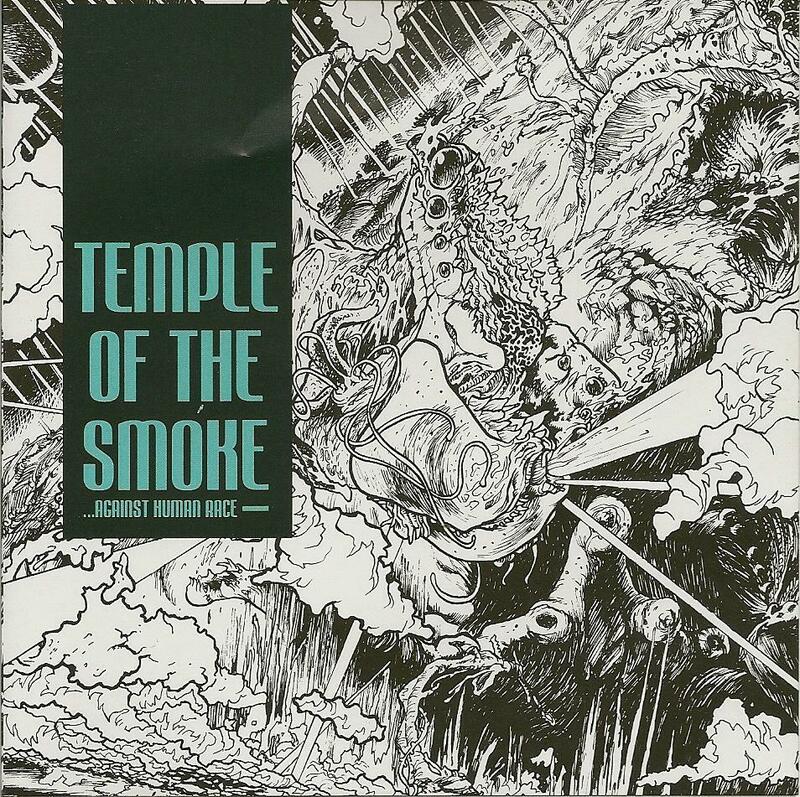 Formed in Belgrade as recently as 2010, Serbian band Temple of the Smoke have released their debut album … Against Human Race on the Russian Association of Independent Genres label in 2011 (following the free download EP Consecration & Temple of the Smoke Big Band released earlier the same year). Such a nihilistic title may have been a factor in one reviewer commenting that the (pretty much) all-instrumental album “… indicates just how screwed up the world is”, while the band name brings to mind pure stoner rock, both giving premature warning of a bleak listen ahead. True, there is a certain amount of dark energy to be found on “… Against …” but there are also lighter shades and colours, as well as a multitude of influences beyond mere stone-age jamming. Comprising Dragan Mirkovic (drums, percussion and most excellent nom de rock), Dusan Zica (guitar, synthesizers, samples), Marko Ilic (bass) and Janko Strojanovic (guitar, voice), the band have obviously got their obligatory Hawkwind, Black Sabbath and Ozric Tentacles credentials sorted, but have also had an ear for less obvious influences – for example the heavy dub rhythm track and chukka-chukka guitars of Unnatural Recession brings to mind The Clash’s Guns Of Brixton. Opening track Illudium Q-36 Explosive Space Modulator (nice title) comes out storming like Queens of the Stone Age riffing on a razor blade, before breaking down to just bass overlaid with soaring Edge-style guitar and bubbling synths. Following the dub-plated Unnatural Recession, the ten minute Naked Sun brings to the table a high energy yet melodic spacerock jam that is a perfect example of how to bring about sonic mood changes without resorting to the rather clichéd “loud bit/quiet bit” formula. Deadly Skies has a rather funereal opening but for sheer menace it pales in comparison to South of Heaven with its doom-laden Iommi-style riffage. This contrasts in turn with the reggae beats of Into the Storm with its (ironic?) sampled message that “citizens need to be armed to protect themselves from a tyrannical government”. Closing track Tortoise Du Mars is perhaps the most obvious nod to the space fusion sounds of Ozric Tentacles, until the roaring and distorted guitars emerge from their protective shell. Beyond this is about eight minutes of void, as if nobody had quite remembered the tape was still rolling – strange and perhaps a little anticlimactic to be waiting for a hidden track which doesn’t exist. Taking many varied styles, Temple of the Smoke have managed admirably to weld and weave them into a thoroughly cohesive whole. Each individual track on its own is great; together, they present an epic sonic experience not to be missed for fans of psychedelic spacerock. If you think you don’t need to hear yet another album of instrumental stoner rock, you most definitely do need to hear … Against Human Race while it is still smokin’!